Sir John Bright is an interesting example of a family rising from yeoman to knight in three generations. 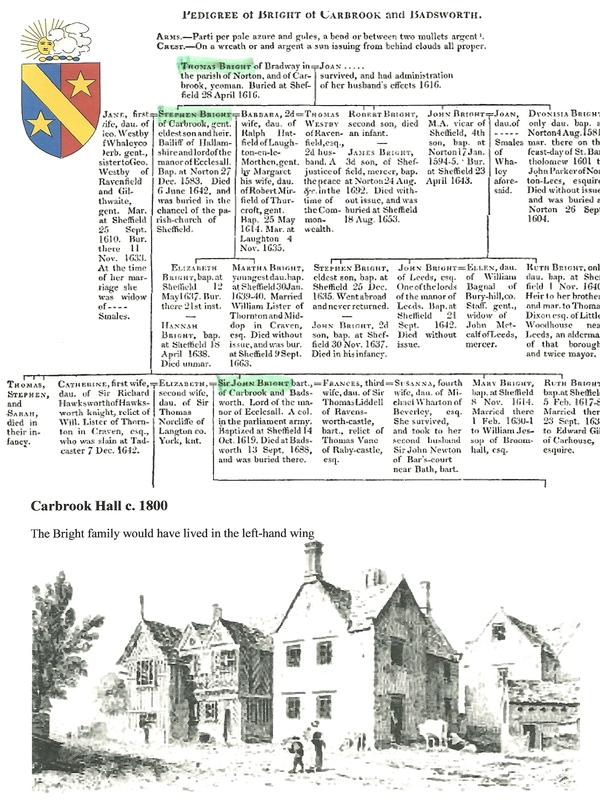 His grandfather – Thomas Bright of Norton and Carbrook –was a yeoman farmer, his father –Stephen Bright of Carbrook – used the profits from his office of Bailiff of Hallamshire to help purchase land worth £600 per year and Sir John followed in his father’s footsteps as ‘a relentless operator of the Yorkshire land market’; his estate almost tripled in value between 1642 and 1660. After 1660, most of his income derived from rent receipts, money lending and marriage portions (he married four times).His most significant purchase came in 1653, when he acquired the forfeited manor of Badsworth[ii] for £ 8,600, which became his principal residence. Between 1641 and 1651, there was a civil war between those who supported King Charles I – the Royalists, and those who opposed him – the Parliamentarians under Oliver Cromwell. Sir John Bright a leading figure among the West Riding Parliamentarians, took up arms for the parliament armies at the outbreak of the civil war and raised several companies in the neighbourhood of Sheffield, receiving a captain’s commission from Lord Fairfax. In 1643, he became colonel of foot and commanded a brigade at the battle of Selby. On the surrender of Sheffield castle, he was appointed governor; in August 1643, he was also military governor of York. In 1654 and 1655, he was High Sheriff of Yorkshire; he acted as governor of York and Hull. In 1654 he was M.P. for East Riding; he was admitted to the order of baronets in 1660.